I've known nostalgia all my life. Even when I was young enough to “barely have anything to be nostalgic over“, as the grown-up would have you very well know. But all children understand that there are worlds upon worlds in their imagination, and that matters which are deemed small by the adult world may indeed be of great value to the child, and go deeper than anyone fully sane thought possible. 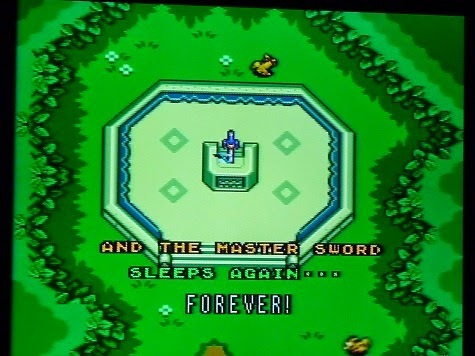 And thus, when I finally conquered the Green Hind-legged Boar (Ganon) in The Legend of Zelda: A Link to the Past (ALttP) at the age of seven, a sensation of bittersweet longing for not having done so washed over me. In a sense, the game was impossible to finish, since every time I loaded it up Ganon was still alive, and my Hero was ready for another round (because there was no option to save the game after having defeated Ganon). But in my heart I knew that things would never be the same, or that indeed they would always remain the same, in the game, but that I, having defeated ganon, had changed. At some point I discovered that there were more things in the game besides my relationship with it that seemed incomplete. Sure, there was always the relatively insignificant matter of not having collected all the heart pieces, but there was also something at once more sinister and comforting going on. It seemed as if the map – and thus in extension the world itself – in A Link to the Past was… unfinished. The corners of the map were covered in clouds, which meant mystery. Every time I booted up the Super Nintendo cartridge and found myself having nothing left to explore, a feeling of melancholy would take hold of me, leaving me treading old ground, yet being unable to leave the world behind. I would just sit there in front of my TV, staring beyond the screen while traversing Hyrule with my well-worn and trusty Pegasus Boots, completely in control of what was going, yet in a sense – not there at all. At times I was more aware of what I was doing, or at least had a sense of purpose while doing it. I tried tracing the outlines of the clouds while high atop Death Mountain, the only place outside of the map where the clouds could actually be seen. Up there I felt closest to breaking some sort of barrier, but in the end I didn't manage to get on top of or beyond any of the clouds. When the meticulous method of trying to bomb my way through every inch of Death Mountain failed, I'd resort to shifting between the full world map and a smaller piece of it where my avatar was localized. Having done so, I'd haphazardly press buttons, hoping that by sheer force and willpower I'd finally come across the magic combination that would unlock secrets and dispel fogs, opening up the world to reveal something unseen - new. Although my quest for something "new" took up quite some time, it was the familiarity of the world and it's mysteries that brought me back time and time again. Thus, when menacing storms were approaching in the world outside of video games, so would my need to return to my Hyrule, my clouds therein, and what was within and beyond them, grow. Homes are what we make of them. 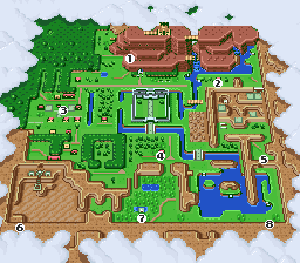 I doubt that the designers behind ALttP had in mind that I as a player would be returning to certain places in Hyrule time and time again, effectively treating it as a sort of camp, stronghold, resting place – home. I found several such places of rest after I started playing ALttP as a walking simulator/interactive screen and/or life-saver. The former resting place of the Master Sword in the Lost Woods, a lush grove with enchanting music, was one such place. Embedded in that location was perhaps the strongest symbol of dissonance between completion and fundamental incompleteness which inhabited the limbo that the myth of my Hero of Time – and my save file – had become. Ah, yes. The flute boy. The Flute Boy is seen playing for the wild animals of the grove. Approach them, and both the animals and the apparition of the Flute Boy disappears4. Return to the Haunted Grove in the Dark World (after the fall of the Golden Land) and the Flute Boy is transformed into a strange creature (trickster fox), not unlike Link himself was turned (into an innocent bunny) upon his first arrival in the Dark World. Link goes on a journey to find the flute which the Flute Boy lost, and when he brings the flute back to the Flute Boy in the Dark World, the Flute Boy says he can't play it anymore, but that hee would very well like to hear it's melody one more time. Turns out, this would be his last wish, as Link's playing of the flute petrifies the boy into a tree. The Flute Boy's apparitions cease to exist, leaving only the tree stump, and the memores, behind. I don't roam the world of Hyrule anymore5, barely even the newer versions of it6. After all, Koholint Island and perhaps even Hyrule is at risk of transforming into a nightmare if the dreamer stays too long7. I stopped playing A Link to the Past many years ago, and even though my world today is "more Corinthian than Kokirian"8, Hyrule still lives through me. Still has it's pull. Mostly in the form of theories concerning the nature of the world of Zelda and it's franchise (especially Hylian Dan's wonderful takes on the recurring themes of Zelda games9), but certainly in and of itself due to my fond memories of ALttP and other Zelda titles. Due to my need to retread, and stir up, and dig around old ground, and due to the fact that there always will be storms ahead of us, and the shifting tides of what our past means to us. The Haunted Grove will probably always have a piece of my heart, as will other places I've known as home, as (songs of) healing, as topographical points of mindfulness, as reveries, as empyrean realms, ageless playing pens - to have and to hold, to cherish and behold. I believe that there will always be a returning sense of incompleteness in my life, simply because that's what life is with it's directional arrow of time. Peace will be hard to find, while regret – not as much. Today, I understand The Haunted Grove as a liminal Otherworld, a threshold where childhood bliss and youthful distress share possibility-spaces for both growth and stagnation. It's the center of the hurricane, if you will, a mirror into a lighter world, but a mirror which is neither only a Mask of Truth, nor but a dark, lo-mask of nostalgic untruth - but both. I hold it up toward both the past and the future, the need for a home and the need for travel10. The grown-up accepts that the clouds of the Hyrule world are mere instrumental tools for the marking of the “game world proper” - a system for demarcating the terminal point of non-experiential, objective reality - but the child with the beginner's mind dreams of what lies beyond, and while doing so makes the world within and in the clouds both home and travel companion. From time to time, my present situation harkens me back to Hyrule, implores me to find old homes and stay there a while and listen. And I do, albeit not in any formal sense which involves controllers and cartridges. I barely even know why that is. But what I do know in my heart of hearts is that I will be forever returning to the 32-bit Hyrule of my childhood, and even if I do so by adult means, I'll always meet my younger self there - my link to the past. As Hylian Dan would have put it – we let go of the tree to explore the world beyond it, but the tree is never lost. Written for Critical Distance’s Blogs of the Round Table for November, Home Sweet Home. Click here to read other submissions for this month. 1 Another observation to make is that on the fan-made maps of Hyrule where the Lost Woods are edited into the overworld, the Grove where the Master Sword rests is nowhere to be seen, because it just doesn't fit into the gamespace. In order to go there, one just has to take a leap of faith and get lost, go beyond the symbolic realm of spatial representation and take on the stuff of legends. As Fado from Ocarina of time says: "Anybody who comes into the forest will be lost." By losing ourselves we find ourselves, right? 4The Flute Boy's father tells Link that Flute Boy went off in search of the Golden Power and never returned. 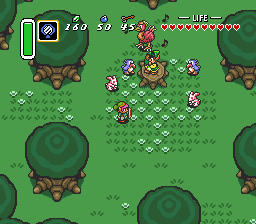 When Link visits the Kakariko Village Inn, he is told by the Innkeeper how the Flute Boy had a pet bird who flew with him everywhere and how they went to Death Mountain but never returned. 5The hero leaves the unchanging world, even though zie is warned that those who leave will one day die. 81 Corinthians 13:11: "When I was a child, I spake as a child, I understood as a child, I thought as a child: but when I became a man, I put away childish things." 10Why leave at all? Koholint—sorry, Hyrule, is nothing less than a paradise, an infinitely beautiful and comforting home. 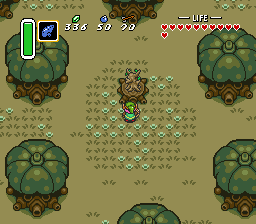 The only way to leave the Kokiri Forest—my mistake, Koholint, is to awaken the Wind Fish. 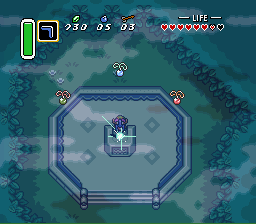 And as Link eventually learns, waking the Wind Fish means that Koholint will vanish, for the island is but a dream. But one needs remember that dreams are important, too. We certainly do seem to have been thinking similar things as we looked beyond the physical boundaries of our games as children. I wonder if that's simply an inquisitiveness we lose over time or a sign of our young selves failing to see the true artifice of game worlds? I know I certainly don't look at a faraway place in a game and think very much of it - let alone attempt to reach it - if it isn't explicitly shown to be part of the diegetic (for lack of a better word) world. I look at things in a much colder, mechanical way now, and that removes much of the emotional connection which seems to have led us both to hold these locations within ourselves for so long. I kind of hope, deep down, that it's neither and I'll some day wake up and be able to imagine again. I'd forgotten all about the "HOLE" note. Looking at the diversity of theories, I'm almost certain that speculation is more rewarding than knowing the (likely) mundane truth. I'll hopefully see you for December's BoRT. It's always a lot of fun.